Harold Pinter' backwards timeline play, Betrayal, takes the stage at Mile Square Theater. The slightly autobiographically inspired play tracks the years-long affair of Jerry and Emma as Robert, Emma's husband and Jerry's best friend, watches from afar. The year is 1977. Emma and Jerry meet up two years following the end of their affair. She reveals that after learning that her husband Robert has been betraying her with affairs of his own, she spills the beans on the nature of her relationship with Jerry. But rather than seeing the aftermath, playwright Harold Pinter goes backwards as we watch how it came to this. Regarded as one of Pinter's finest texts, Chris O’Connor directs this juicy drama of deceit, dishonesty, and, oh yeah, betrayal with great purpose and ease. There is a specificity in the tempo and cadence of Pinter's text. O’Connor approached it with immense care, finding the beats and exploring the necessity of silence. But the intimacy of the story seemed to be lost, perhaps due to the great expansive feel of the space. Designed by Matthew J. Fick, the set looked exquisite with the clean lines and rustic floor. Combined with the boldness of the white walls, the excessive negative space wasn't used to its advantage. O’Connor played into body language but not quite with spatial relationship. And there is a story of its own there. For example, how O’Connor sat Emma on in the middle bench, leaning toward Jerry, put her on his side in the trio's discussion. It was a stunning stage picture and a strong moment of story. These moments could have been played with even further throughout the play. Look at when Emma and Robert were in their hotel room. As soon as Robert figured out the truth of the affair, he needed to assert his power by creeping in closer to Emma, not stand stationary on the other side of the room in an almost cavalier manner. With limited furniture and architecture for the characters to utilize, it created some obstacles. There was a sense of nowhere to go. It's a slippery slope to fall into the realm of melodramatic soap opera. The soundtrack provided by Kari Bernson in the transitions pushed it in that direction. While the men were dressed properly dapper, the outfits Peter Fogel placed on Emma were simply exceptional. Not only did the rich color pallet fit her personality, the silhouettes and patterns lived in the period but also managed to reveal so much about the character. Betrayal is one of those plays where the content is seeping with potential in character. Pinter has painted a broad picture on who these three individuals are but the dynamics and chemistry makes the play tick. If there was ever a pair you wanted to see work, it was Jerry, played by Aidan Redmond, and Emma, played by Dena Tyler. They had a fervent magnetism that was transcendent. Tyler is remarkable, gravitating toward the danger of the affair. Redmond as Jerry had a genuine aura of amiability. It’s no wonder Emma was drawn toward him. But for this play to work completely, the casting of Robert is key. You must believe that there is something, aside from cultural, familiar, and class taboos, that would keep Emma from staying with Robert. Likewise, the friendship of Robert and Jerry is key. Unfortunately, Matthew Lawler as Robert seemed to be living in his own play. It's like he's in the Monty Python sketch version of Betrayal. Lawler has a natural comedic presence that didn’t quite match Redmond and Tyler's dramatic prowess. Cut Robert out of the equation, this Betrayal becomes infinitely more engaging. Some of Lawler's choices seemed to defy Pinter and O’Connor’s intent simply based on the actions of his scene partners. 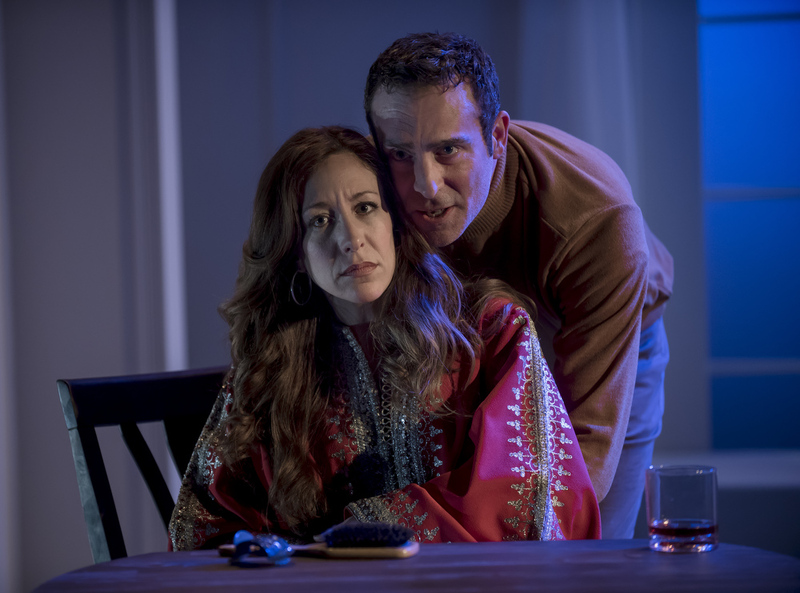 At times, Mile Square Theatre’s production of Betrayal is ripe with intrigue. And then it seems to stumble, needing time to get back on track. You don’t think that the little things will hurt the big picture, but as the little things add up, the big picture doesn’t look so pristine. Put a filter on and you might see it that way.